The ski resorts in Andorra have evolved considerably in recent years. The facilities were formerly quite simple and basic but nowadays the resorts in Andorra have become fully-fledged ski resorts. Because of the enormous investments made in these resorts, the prices have naturally risen and the number of new hotels and lifts increases each year. 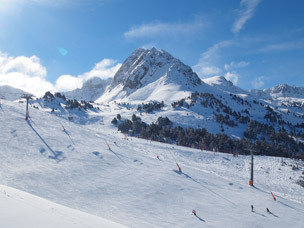 Although the ski resorts in Andorra are not nearly as cheap as a few years ago, they still represent a less expensive ski holiday option compared to ski resorts in the Alps. Thanks to the recent changes, winter sports in Andorra have become a lot more popular and you will now always find some cozy après-ski bars and at least one nightclubs in the various ski resorts of Andorra. Those looking for a versatile ski holiday in a totally different environment can confidently travel to a ski resort in Andorra.